We agree that the impact of market participants’ behaviour tallies with Marks’ view, but think that we have reached this point of the cycle in asset prices almost entirely without the optimism or risk-seeking behaviour that Marks warns of. In fact, we think investors' motives may be quite the opposite: still scarred by the financial crisis they have a powerful desire to avoid capital loss, even over the short term, and a need for stable returns from that capital. A broad-based belief that the outlook for the global economy remains highly uncertain - a perception amplified by a political landscape of unprecedented instability - doesn’t help confidence. Whereas most bull markets and bubbles are driven by investors’ focus on capital gains, and their subsequent fear of missing out, we think that this market has been driven by an overwhelming desire for capital security or perhaps modest gain. Securities that offer certainty of yield (irrespective of the underlying assets) or certainty of growth (the tech mega-caps) have attracted the largest flows. These trends have persisted largely unchanged for years. Yet collectively, this risk-averse behaviour has driven asset prices to alarming levels. Where capital flows in, price increases duly follow. So prices of apparently safe, stable assets have soared, meaning long-term asset owners face a remarkably challenging market, where it has never been so risky to be safe. “what the wise do in the beginning, the fools do in the end”. It’s common for asset price booms eventually to draw in investors who were initially sceptical. This was certainly true of the original tech boom, when the sceptics on the sidelines were taking on ever greater amounts of benchmark risk and career risk until most were forced to join the party. But this time, it is not just sceptics joining the fray and pushing prices ever higher. More important is the boom in new, non-discretionary vehicles such as passive funds, ETFs and quant strategies. Again, it is worth highlighting that these allocation decisions are usually not founded in a ‘risk-on’ mind-set, but instead represent a desire for low-cost access - nothing more. 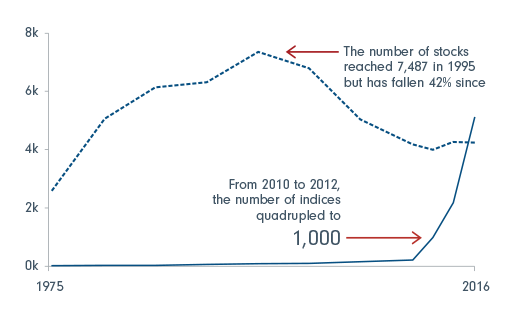 The cautious investor mind-set is also reflected in the growth of low-volatility strategies. They aim to achieve modest absolute returns through investing in low-volatility assets, reducing the risk of a loss of capital. Yet when investors flock towards particular assets over any length of time, the reported volatility of those assets declines, because drawdowns are contained by persistent buying. 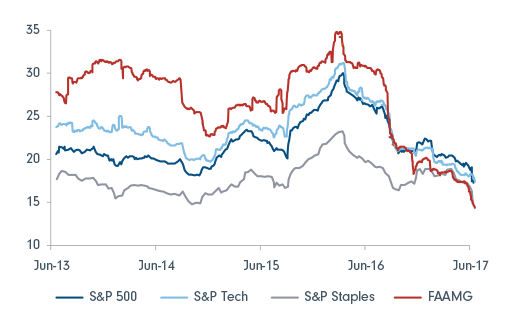 What appears to be happening now is that the sustained inflows into tech mega-cap stocks in the US are fuelling a self-perpetuating cycle. Remarkably, these stocks have a realised volatility lower than consumer staples or utilities. This will have led to additional demand from minimum-volatility quant strategies and ETFs as well as market capitalisation-based passive strategies. Understanding this helps to explain not only the performance of the tech mega-caps in the US, but also why the dominant market capitalisation structures in other markets have persisted. FAAMG stocks are: Facebook, Amazon, Apple, Microsoft, Google. Source: Goldman Sachs, Fidelity International, June 2017. Too risky to be safe? There is little doubt that investors would do well to heed Marks’ warning about many asset prices. It may be true, as he points out, that value investors have a tendency to sound the alarm early, but there are certainly enough examples of allocations shifting to riskier assets - and of riskier assets becoming mainstream - to give us pause. But, we think it is also important to consider the dominant investor psychology - the motives of significant actors - to assess the gains made in recent years. In contrast to the previous boom, it is a broad-based flight to safety and capital loss aversion that is fuelling the rise in US tech giants’ shares. This leads me to very different conclusions about where the risks of material capital loss lie, if indeed we are approaching the end of the post-financial crisis bull market. It could well be that securities which are unattractive to those with a strong aversion to capital loss may paradoxically prove to be the most resilient. In other words, if the price of avoiding volatility is elevated, there may be an economic rent for taking on the volatility that others reject.